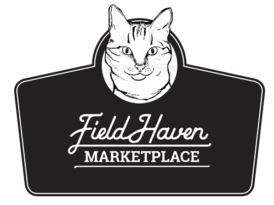 Thank You to the Community of Lincoln for Voting FieldHaven Marketplace your FAVORITE Thrift Store of 2018! Each time we place a cat or kitten into a new home our wish for a long, comfy life goes with them. We have heard from many of our alumni adopters over the years and cherish each story we get. Every photo is looked at with loving and thankful eyes, but the stories and photos of Gypsy and Noah are among the most precious of all, as their story was the start of FieldHaven and all that it is today. In July of 2003, before the concept of trap, neuter, return (TNR) was widspread, sisters Joy Smith and Jann Flanagan heard about a ranch that had several feral cats with kittens. They trapped them and, once the kittens were weaned, the mamas were spayed and returned to the Hutchinson Ranch where they were originally found. The kittens were socialized and soon ready for adoption. Looking for a kitten, Terri and Howard Parker came to a little makeshift “booth” set up in Beerman’s Plaza at the Lincoln Farmer’s market and fell in love with one of these kittens – a little waif who was named Laurel. Gently petting and swooning over her as she sat in the palm of Howard’s hand, they fell in love. Laurel, soon named Gypsy, had purred her way right into Terri and Howard’s life and hearts. Even better, they returned several weeks later to adopt Noah, one of the other kittens up for adoption. Throughout the last fifteen years, Terri and Howard have stayed in touch, and it was with great sadness that we learned Gypsy had passed away earlier this year, close to her 15th birthday. As sad as this was to hear, it brought us full circle back to the beginning of FieldHaven. Her story, after all, is exactly why we pour so much of our hearts, souls and energy into saving these deserving, beautiful little beings. It is hard to imagine that FieldHaven might not exist f not for Gypsy, Noah, and all those kittens saved back in 2003. Instead of being kittens who perished in a feral colony, they lived long and wonderful lives filled with love. How fitting it is that Gypsy’s birth was the inspiration for FieldHaven and her passing to the Rainbow Bridge occurred as we celebrated our 15th anniversary. FieldHaven staff and volunteers love hearing from our “alumni.” Every story and photo reinforces why we do what we do. Do you have an alumni story? Please share it on our Facebook page. When FieldHaven heard that Yuba County Animal Care Services (YCACS) needed transport for 20 kittens to another shelter we had to act. With kitten season in full swing, kittens were arriving every day, sometimes left in boxes at the door when the shelter was closed, leaving the shelter critically overcrowded. The only problem was that the receiving shelter was hundreds of miles away in Seattle! It was not long before staff members Scott and Jyll stepped up for the challenge. They arrived at YCACS at 5:00 pm on a Tuesday prepared to take the twenty abandoned kittens on the long journey north. A shelter worker then stated, “If there is room, we have five nursing mothers with kittens.” Before long, Jyll and Scott had their car loaded with not twenty, but forty felines headed for new lives in Washington. Anyone who has traveled with children knows about bathroom stops and kittens are no different. Every two hours, Scott and Jyll stopped to scoop and clean each and every carrier. At each rest stop, people wanted to know about this incredible, lifesaving journey and cheered them on. They drove through the night arriving in Tacoma earlier than anticipated and found a park where they could rest in the shade and recheck each kitty before delivering their priceless cargo. Soon they were at Seattle Animal Services, where each cat and kitten was received into loving, open arms. It was a thirty-nine hour labor of love for Scott and Jyll to deliver a carload of forty deserving kitties who now have a future and are sure to find loving homes where they can give and receive love, comfort and purrs for the rest of their lives. Scott loading up the precious cargo. Taking care of business at one of many kitty pit stops. Volunteers and cats arrived safely at Seattle Animal Shelter thirty-nine hours later. Not only are we celebrating 15 years of caring for cats and kittens, but on June 11th we had a very special happening. The very first spay was done in our brand new Hathaway Surgery Suite! Thank you Dr. Heather Kennedy and RVT, Kimmie Soler! The surgery suite was generously gifted by Mark M. Glickman in honor of his beloved kitty, Hathaway.